Contrary to what the movies would have you believe, you don't need a golden tan, awesome bod and long blonde hair to surf – and that goes for girls AND boys. Surfing is the very definition of ‘easy to learn, hard to master'. Standing on a surfboard is actually quite simple; it's staying there that's the tricky part.As locations go, Ireland is pretty high on the ‘best surf spots' list. Believe it or not, Lahinch in Clare and Bundoran in Donegal are world renowned. But a sense of touch in your hands and feet would be an advantage Irish waters tend to take away. 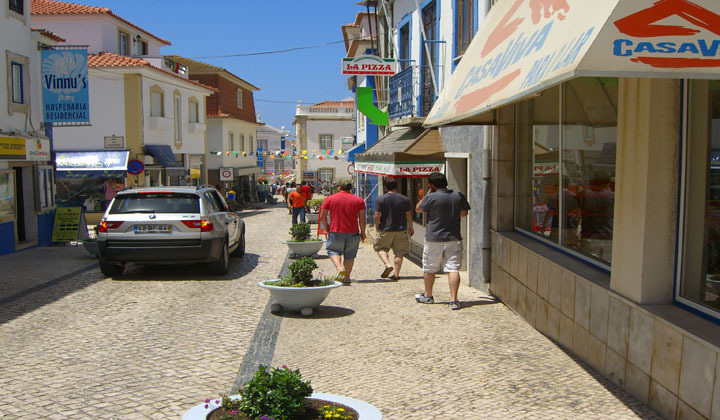 Ericeira is a beautiful town 40 minutes north of Lisbon, nestled on the edge of warmer parts of the Atlantic. Regarded as Portugal's best and most consistent spot for all standards of surfers, it hosts major world surfing competitions yet has beaches seemingly designed for the complete noob. The old town is made up of narrow cobblestone streets filled with small cafÃ©s and bars, and is elevated on the cliffs from the beaches and fishing port. The real gems hidden in Ericeira are the Eco-Lodges. Book the package through surfholidays.com , and you will stay in the most adorable accommodation ever. You'd walk right past the wooden door without even noticing, but go through and you'll find yourself in the cutest little complex, with just six two storey wooden houses gathered around the natural eco-pool – a beautiful lagoon swimmers can share with frogs, whose lily pads keep the water clean and chlorine-free. The pool is flanked by a vegetable garden visitors can tend and use for cooking on a huge communal BBQ, while beneath the complex is a grand games/chill-out room with plush leather sofas, pool and fussball tables, self-serving bar, and movie and sound systems. Each house comes equipped with a balcony hammock, and there are lots of little recycling reminders that actually aren't annoying. In fact, you'll feel so indebted to Ms Nature at the end of your stay you'll find yourself going through your trash and separating. It is the perfect place to relax after a hard day of lounging on the beach. 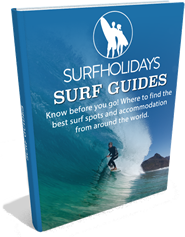 The surfholidays.com instructors are excellent – they will have you standing after your first hour. Surfholidays.com also offer yoga classes, should you require extra limbering. The idea of a surfing holiday on the Portuguese coast sounds expensive, but it's not. A week's stay in the Eco-Lodges in peak season is just €1,125. Don't forget they sleep four, so that's just €281.25 each. Six days of surf lessons are only €98 per person. Aer Lingus fly from Dublin to Lisbon every day of the week, and cost as little as €80 return if booked well in advance. And if you decide to go off-season outside of the summer months, the lodges are just €680 for the week – almost half price. In addition, your euro will go a lot further over there – coffees are 50c, beers €1 and a delicious meal for four with two bottles of wine will barely set you back €50. If you've never tried surfing, or never even thought about trying it, you should definitely consider a trip to Ericeira. And if you can round up 23 friends, it is the perfect place to book out completely for yourselves.